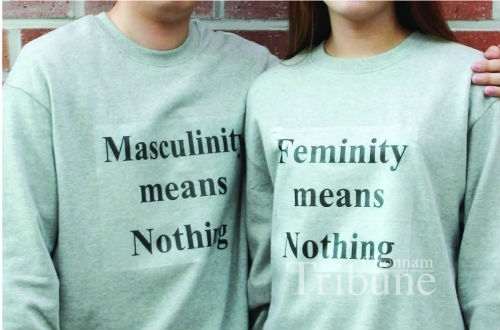 ▲ A female student and a male student are wearing gender-neutral T- shirts with the words “Masculinity means Nothing” and “Femininity means Nothing” respectively. The sentences imply that it is time to break down gender stereotypes and move toward a genderless society beyond the binary gender. We can see cross-gender casting on stage for a musical or a play these days in Korea. Jesus Christ Superstar, a musical play presented in 2015, had a female actor playing King Herod. Now that three years have passed, gender-free casting has become a trend to audiences. It is even natural that the audience meet actors portraying the characters of the opposite gender. The gender-free phenomenon has been spreading into everyday life such as clothing, language use and early childhood education beyond a trend in particular fields. There have been significant changes due to the impact of genderless culture. As mass media is a very sensitive domain to cultural trends, the genderless culture has caused considerable changes in their content. Men were conventionally banned by a tacit regulation to step inside a kitchen in our country because cooking was traditionally considered women’s work. However, we interestingly watch male celebrities cook their own supper in a TV show “I Live Alone”. Meanwhile, another TV program “Daughter-in-law in Wonderland” recently featured a married couple MMary and J Black who are leading dance choreographers. J Black was very natural in doing house chores, and no obligation about conceiving a child was imposed on MMary. The couple said that bearing a baby is just an option because MMary loves her job and does not want to be deprived of a chance to expand her career. Gender roles in television dramas are also becoming genderless. Seol Yu-mi (Sophomore, Dept. of Japanese Language and Literature) commented, “It seems that women have become self-reliant, and men are becoming more of a family man compared to characters in the past.” More recently, a female main character in a TV drama “Mr. Sunshine”, Ko Ae-shin, actively engages in a loyal troop activity right before the Colonial Era. Even though she was a noble mademoiselle, she did not rely on anyone to protect her and went her own way. Few women characters were described like her in the past dramas which are featured in the same era. This shows that the way of expressing people in the media has undergone a significant transformation. The cosmetics industry is changing rapidly. Staff at a cosmetics shop located near CNU mentioned that more and more men customers are looking for facial makeup products. She continued, “An eyebrow pencil is one of the most basic makeup beauty tools, followed by a dark-toned foundation and a concealer which fit well with men’s mostly darker faces.” Makeup was considered a female-only property and a kind of a social obligation. However, women now say it is unreasonable to force them to always be beautiful by wearing makeup, which should be an optional choice as a way to express oneself. Men, who were willing to make themselves look better freely but could not due to social prejudices, started their own makeup pursuing that idea. Some of them upload video clips about how to put makeup on their faces on YouTube and even become beauty influencers. Meanwhile, it makes more sense to see garments in pink or red color with ribbons at a Men’s Wear section in a shopping mall. It is also natural that there are oversized trousers, coats, and T-shirts at the Women’s Wear section. This seemed improbable only five years ago. Now in 2018, more and more people are showing off their individuality by genderless clothing and even with accessories that are no longer the exclusive property of females. Men wear various kinds of accessories on their ears, fingers, and everywhere they want to wear something. Although it is still unnatural to see men wearing feminine things on the street, some celebrities have contributed a lot in setting a genderless fashion style more widely popular with ordinary people. G-Dragon, a world-renowned singer and representatively a fashionable celebrity, wore fancy necklaces and earrings, a pink-colored tweed jacket, and blouses with ribbons. This figure continues to appear mostly on K-POP stars. Genderless culture has also affected what people speak of and the way young children are raised. 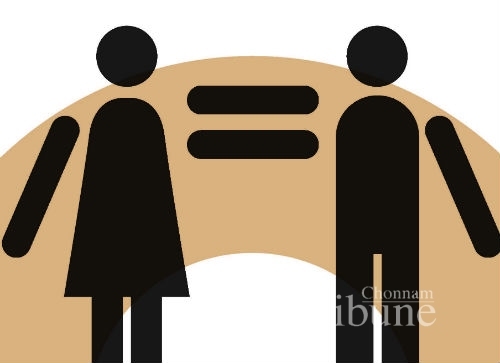 Recently, the Seoul government carried on a campaign to compile a ‘Languages on Gender Equality Dictionary’. A Seoul citizen suggested not using the Korean word ‘ja-gung’, meaning embracing a son in the womb. It is due to a radical inquiry that ‘ja’ only specifies ‘son’. Instead, a claim that ‘po-gung’, meaning embracing posterities whether it is a daughter or son, was brought up among human rights activists. Another word suggested to change is ‘chul-san’, meaning bearing a child. But the word ‘san’ implies that women are just a means to give birth to a child. ‘chul-saeng’, meaning a child being born, is regarded as a politically correct expression. Early childhood education is another domain influenced tremendously by this culture. Parents expect their daughter to learn how to make their appearance prettier, and their son how to take aim at an object more accurately with their toy guns. Not anymore. A new version already under way breaks the binary gender-based stereotypes. While little boys are polishing their nails and girls are acting daddies in a role play, children grow up without unconscious barriers about gender roles. Playing with toys is also a good way to educate children. They can learn how to use their body and get used to different situations through role playing sets. Unlike other countries such as the U.S. and Denmark, however, it is regrettable that gender stereotypes are still having a silent influence on most Korean children. One member of staff at a toy shop near CNU stated, “Most toys are labeled by age, but a few are still stating those for a certain gender.” If parents buy their children prejudiced products, the children would think they should always be playing with pink or blue toys according to their gender. They will not fully gain experiences and place to imagine the real world if there is a lack of types of toys. Wearing genderless garments and accessories shows people’s desire to freely express themselves. Kim Da-woon (Junior, Dept. of Clothing and Textiles) mentioned, “Genderless fashion is not firmly settled down, as even the manufacturing method of men’s and women’s wear still has a difference. But the culture itself is worth noticing because a clothing culture might have a crucial meaning on our progressing society.” In case genderless language use and education are more prevalent among people, those are expected to be helpful in forming the atmosphere of treating a person as oneself. Kang Yeong-ju (Junior, Faculty of Business Administration), who is taking teaching profession courses, expects that struggles between the two genders would appear less than now, if children are taught in a genderless educational method. “It is because children will learn how to treat people as a human being, regardless of gender,” she added. A cultural critic once stated that the influence of genderless culture on media content was very meaningful, although it was strongly affected by commercial elements. He added we needed to consider these: what are the values of genderless culture, and how the value can be realized. 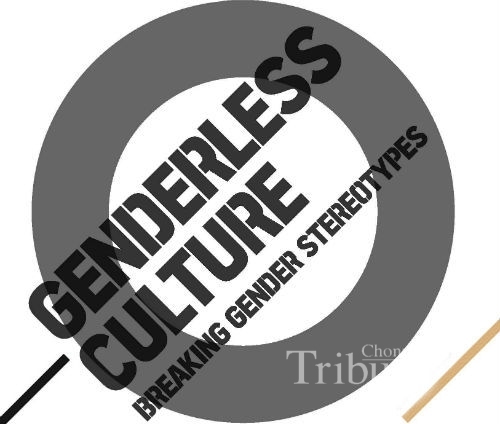 Genderless culture has gone further into the stream of gender equality. The Korean Institute for Gender Equality Promotion and Education hosts the Contest of Gender Equality Design. The growing number of works submitted to the contest annually indicates that more attention is headed to the culture of freeing ourselves from gender stereotypes and pursuing gender equality. The portion of parents taking care of their babies also came to be more equal. Now fathers often oversee a baby carriage instead of mothers so the packaging features a male holding a baby. ‘Genderless’ means being oneself in its entirety. Since everybody is born with a gender, they are imposed with certain gender roles that are regulated by socially constructed norms. However, the genderless culture proposes not to do so. It is needed to respect each other’s personal gender identity and not force one to keep a certain gender role. Everyone has the right to choose what they want regardless of gender stereotypes that were taken for granted.